Tom Brady suspension overturned: Roger Goodell comes out like a buffoon in Judge Richard Berman's ruling. 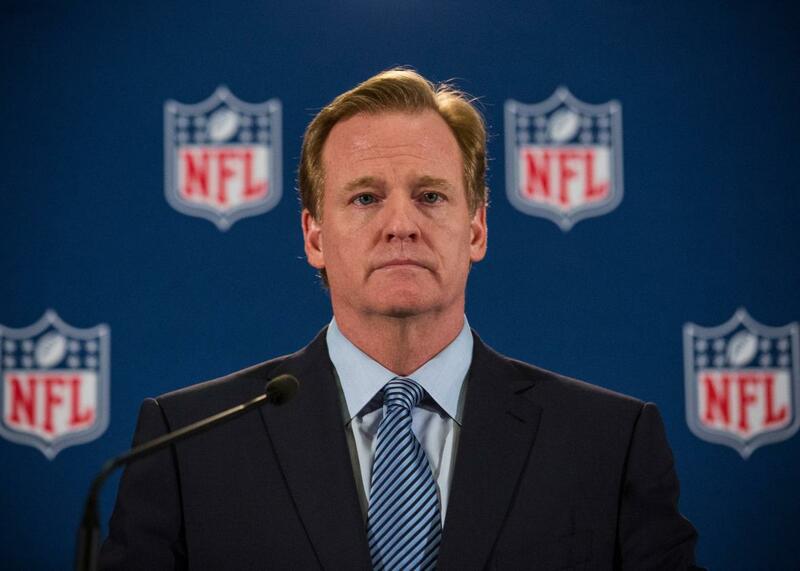 NFL Commissioner Roger Goodell holds a press conference on Oct. 8, 2014, in New York City. Judge Richard Berman’s ruling on Thursday to overturn Tom Brady’s four-game suspension for his alleged role in the New England Patriots’ deflated football scandal was a blow to the NFL’s ad hoc system of player justice. NFL Commissioner Roger Goodell comes off terribly in the decision for the arbitrariness with which he meted out punishment in this case. While arbitrary decision-making is in line with his past actions, seeing a judge pick apart the absurdity of Goodell’s decision in such an already silly case—a dispute over how much air was in a football—makes Goodell look more like a buffoon than ever before. Here are Berman’s harshest words for Goodell, along with the sections that best illustrate the foolishness and randomness of the league’s conduct policy and disciplinary procedures. First, on Page 15, Berman describes how Brady never received advance notice of what his possible punishment might be, a right the judge later describes as being “at the heart of the [NFL’s collective bargaining agreement] and, for that matter, of our criminal and civil justice systems.” The NFL initially cited Brady’s alleged misconduct as a violation of the league’s Competitive Integrity Policy. That policy— which states “failure to cooperate in an investigation shall be considered detrimental to the League and will subject the offending club and responsible individual(s) to appropriate discipline”—was never given to players. Berman would later cite this lack of warning as a violation of fundamental fairness on Goodell’s part. The next page shows the NFLPA’s lawyer describing how the punishment for first-time equipment violations in the player’s manual that Brady did actually have was a $5,512 fine, not the four-game suspension that Brady got. The mention demonstrates the discrepancy between a reasonable possible punishment and what Goodell ultimately decided. Page 18 shows how Goodell’s reasoning for ignoring the punishment in the player policy manual and going with a harsher punishment was based on an incoherent comparison to steroid abuse, rather than any sort of precedent. On Page 21 the judge puts it all together in describing how there was no way for Brady to know what his punishment might be until Goodell came up with his bizarre steroid reasoning. Then on Pages 22 and 23, Berman explicitly states how nonsensical the steroid comparison is on Goodell’s part. Citing legal precedent on Page 25 to describe this specific case, Berman offers the perfect description of the arbitrariness of Goodell’s player conduct judgments writ large. On Page 35, the judge hammers the so-called independence of Goodell’s disciplinary investigation of Brady, which was conducted in part by NFL executive vice president and general counsel Jeff Pash, the No. 2 executive at the NFL. He also criticizes the NFL for its refusal to let Brady’s lawyers question Pash about his involvement during his initial appeal, which was conducted by Goodell himself, because of a claim of attorney-client privilege. On the same page, Berman emphasizes that Goodell’s claim that this was an independent proceeding is a farce. Note the use of scare quotes and the apparent sarcasm dripping around the word heralded. On Page 37 the judge hits Goodell for not providing investigative files for Brady’s appeal team. And finally, on Page 38, Berman again slams Goodell for failing to uphold his own duty to ensure that the appeal proceeding was conducted fairly. To make matters worse, he cites the previous commissioner Paul Tagliabue’s stinging rebuke of Goodell’s similarly arbitrary actions in the bountygate case, when punishments for New Orleans Saints players suspended for alleged involvement in the team’s cash-for-hits program were overturned on appeal.